An entire Tuscan Stone Farmhouse with two apartments for your holiday near Siena with private swimmingpool (5x10), ping-pong, privacy, playground, pony and free Wi-fi, surrounded by nature. Big covered Patio to eat all together outside with barbeque and pizza oven. Charge station for electric cars on-site. 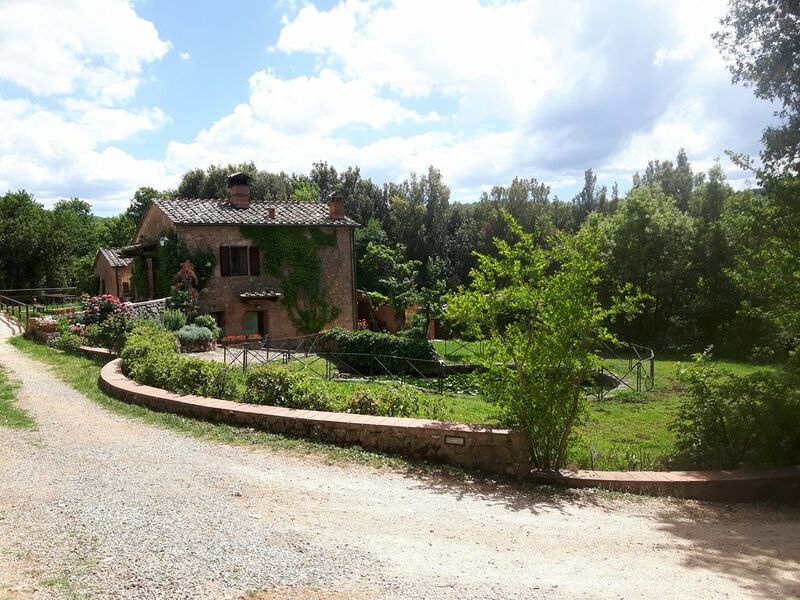 Situated on a hill with its own olive groves in the heart of a real Tuscan unspoiled area. From the property it is possible to have amazing walks in the surroundings. We can organize for you winery visits, guided walks (with lunch and the pony's for the little hikers), dinners and wine tasting at the property. We will think of everything. Just ask us for the possibilities. 'Palio' 6 P : big fully equipped kitchen with oven, microwave, dishwasher, washingmachine, american coffeemaker and big table. Living room with fireplace, sofabed for 2p, tv, desk, library and garden doors. Double bedroom with airconditioning and bathroom. Second double bedroom with airco, private access, babybed and private bathroom with walk-in-shower. 'Casa Fienile' 6 P : big fully equipped kitchen with oven, microwave, dishwasher, washingmachine, american coffeemaker, big table and tv and living corner with sofabed for 2P. Two double bedrooms with access on the covered patio with big table, pizza oven and barbeque. Two bathrooms with shower. All apartments are accessable from groundfloor. It is possible to buy biological wine, honey and olive oil produced by the family. Perfect for families with children and pets. Football, Volleyball, Tabletennis, Playground and pony on-site! Podere Casetta is a biological farm that produces olive oil and honey on 10 hectares of land, immersed in silence and in nature surrounded by meadows and gentle slopes of oaks in the Sienese mountains (Montagnola Senese). The house was build in 1300 and the last renovation was in 2017! Here you will find your true Tuscan holiday, in the middle of nature, taking sun at your private swimmingpool near to the house. We have a well-aired summer suitable for walks in the nearby woods, crossed by several paths, catching sight of charming landscapes, lots of medieval villages. It is also possible to have a walk and explore the private land of the farm, between olive trees, fruit trees and woods. You will surely enjoy this magical place during which, with a little stroke of luck, you might see fallow-deers, badgers, foxes, porcupines, hedgehoges, dormices. You have acces to all the private land of the farm. Olive groves, natural spring, fruitrees, private woods, gardens and swimmingpool. Un unpaved road of 500 meters leads to the house. Perfect base to visit all the important towns of Toscany. Siena - 18 km/11 miles, Chianti, Florence (75 km), San Gimignano (35 km), Volterra (39 km), Monteriggioni (25 km), San Galgano (30 km), Casole d'Elsa (16 km), Colle di Val d'Elsa (25 km), Grosseto - beach (78 km). We are a family with three children, living at 15 minutes from the property. Half Dutch and half Italian. Our guests have all the privacy that they need during their stay but on request we are available for any help or information about the property and environment. From the property it is possible to have amazing walks in the surroundings. We can organize for you winery visits, guided walks (with the pony's), dinners and wine tasting at the property. We will think of everything. Just ask us for the possibilities. We produce several biological products like Wine, Olive Oil Extravergine, Honey and Fruits. Our visitors have acces to all the private land of the farm. Olive groves, private woods gardens and swimmingpool area. Possible to rent bikes, play TableTennis, BeachVolley and Soccer. Playground and pony on-site! We are available for tips about the best restaurants, wineries and places to visit. On request: * Tuscan dinner; * Pizza evening with use of the original wood oven; * Tuscan Wine- and Food tasting with Sommelier; * Pony-ride for kids on-site; * Horse riding off-site; * Rent bikes; * Guided tours with mountainbike or pony's; * Extra Cleaning. Perfect base to explore all the best of Tuscany. Inclusive Siena, Florence, Monteriggioni, San Galgano, San Gimignano, Colle val d'Elsa, Casole d'Elsa, Chianti. Free parking and an Electric vehicle charging station is available on-site. Price is inclusive Towels for bath, kitchen and swimmingpool. Two well equipped Tuscan kitchens, both with washing machine, diswasher, oven, microwave, fridge, american coffeemachine and italian moka. Two well equipped kitchens with oven, microwave, coffeemachine, dishwasher and washing machine. Both kitchens have a big table. Big well kepted garden around the house and property land of the farm with olive groves, fruit trees and woods for nice walks or in mountainbike. Children can play free around the house. Patio with big table, light and pizza oven. View of the garden, hills and the woods. Fenced salt-water swimmingpool. Dimensions: 5 m x 10 m. Depth: 1.20 m x 2.50 m. Pool is open from may until october. Guests have free access to the property land to have a walk between olive trees and woods. Children can play free around the house. Fenced pool. On request: * Tuscan dinner; * Pizza evening with use of the original wood oven; * Tuscan Wine- and food tasting with Sommelier; * Extra Cleaning; * Pony ride for children on-site; * Hiking- or mountainbike tour with guide; * Horse riding off-site. We will be happy to advice our guests where they can find the nice places to visit and good restaurants. The house has airconditioning only in the rooms where it is needed. This home is exactly as it appears. Pure Tuscany. The view up the mountain is beautiful. The owners were very helpful. Would most definitely stay again. I had the pleasure of staying at this property with my wife and 2 year old daughter. We were lucky enough to have the whole farm to ourselves. The property is a recently converted Tuscan farm house and has everything you could need and has been renovated to a very high standard. The farm is wonderfully secluded but also close enough to explore the Sovicille region or a short drive to Siena. My daughter loved the children's playground & pool and is already asking when she can return to "Her Holiday House" . The property is suited to a few people or a large group with space and facilities for either. Liesbeth the owner is very helpful and on hand to assist with any queries or suggestion of places to see or visit. Bellissima la casa ed il terreno, pulito e ben curato, ideale X vacanza relax anche in gruppi e famiglie con bambini. Siena - 18 km/11 miles, Florence (75 km), San Gimignano (35 km), Volterra (39 km), Monteriggioni (25 km), San Galgano -sword in the rock (30 km), Casole d'Elsa (16 km), Castellina in Chianti (35 km), Gaiole in Chianti (50 km), Greve in Chianti (55 km), Castello di Brolio (45 km) Colle di Val d'Elsa (25 km), Castiglione della Pescaia - beach ( 90 km). A security deposit of 300 euro is required at arrival and is fully refundable at departure if no damage is done to property or its contents.